As many of you know, the Lakeport Plantation is part of Arkansas State University’s Arkansas Heritage Sites program. There are now four Heritage Sites: Lakeport, the Hemingway-Pfeiffer Museum in Piggott, the Southern Tenant Farmers Museum in Tyronza, and the most recent addition, the Historic Dyess Colony: Boyhood Home of Johnny Cash. The program also includes the ASU Museum, as well as the Arkansas Delta Byways, which promotes tourism in the 15 county region. Now there is a single website for all of ASU’s Heritage Sites (thanks to the work of Rachel Miller, a graduate student in Heritage Studies program at ASU). 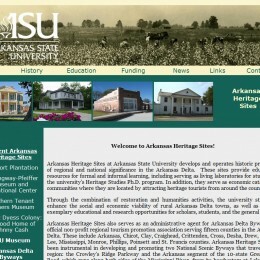 The website gives an overview of programs, with links to all of the individual Heritage Sites’ web pages. 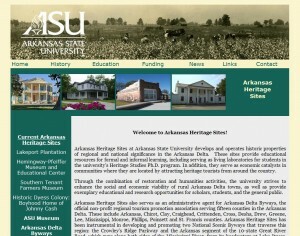 Visit http://arkansasheritagesites.astate.edu to check out all the Sites, their programs, history, and how you can experience Arkansas’s history. Lakeport is closed today (January 10, 2011) due to the inclement weather.